If you have recently decided you want to start getting fit and lead a healthier life, but you aren’t sure where to start then this guide is for you. In last few years, health and fitness has become one of the biggest lifestyle trends and it shows no signs of slowing down. Although it’s great that it is now considered the popular choice to look after yourself, exercise regularly and eat well it also gives a lot of choices and alternative methods to those starting out. Thanks to the infinity of the internet and the rising number of self-proclaimed professional fitness coaches, there are numerous resources online advising what to eat and how to exercise to achieve maximum results. However many of these authors are found to contradict one another, leaving newcomers perplexed and afraid to try certain things out for fear of injuring themselves or wasting energy with regimes that won’t help them achieve their goals. This advice is intended for absolute beginners who have no knowledge or certainty of exercise of healthy eating plans. One of the biggest and most common mistakes that newcomers to fitness make is trying to do too much all at once. Everyone’s ability will vary and depending on the level of activity you currently have, as well as the diet you currently have you could struggle slightly more or less than others with the lifestyle changes you are about to make. To avoid struggling so much to the point of giving up, take small steps to begin with and slowly work your way towards higher goals. For example, if you plan to join the gym aim for two sessions a week minimum and anything else is a bonus. Too many people have marched into a gym with the best of intentions, claiming that they are going to work out five times a week but after just a few weeks due to social commitments or poor health are unable to attend and end up feeling guilty for letting themselves down. Start small and once going to the gym twice a week is so ingrained in your routine that it no longer feels like a chore but is just part of regular life, then you can build up to three times or four times and so on. The same method should be applied to diet. As mentioned before, depending on what your current diet is now you may have many changes to make and therefore could end up struggling to keep up and ultimately “fall off the wagon” and be left feeling sorry for yourself. Eating healthy should not be about punishing yourself for indulging but rather taking control of your relationship with food. 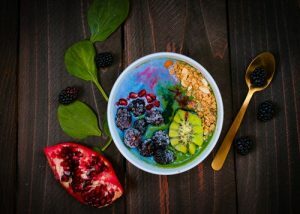 For those who have pre-existing health conditions such as diabetes, inflammatory bowel disease or food allergies or those who are vegetarian, vegan or otherwise you may want to speak to a health care professional if you are intending on changing your diet drastically, to ensure that you continue to get all the nutrients that you need. If you find that you are eating too much of something such as sugary snacks or fast food then you should start by reducing these and swapping them for something more healthy. Once you are able to stick to this change for several weeks and are no longer craving them you can start to alter your diet to healthier, more nutritional foods that are catered to help you achieve the fitness goals you set out.